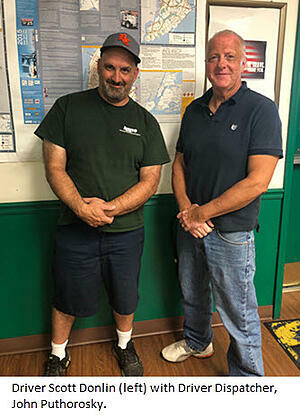 In our “Dispatches From the Road” feature, the KANE Blog will periodically publish interviews with our drivers – the men and women who live and breathe the transportation topics we often write about. In our third installment, we interview KANE driver, Scott Donlin. I was working for a manufacturing company. In a downturn in 1998, I lost my position. Through an employment service, I was referred to a driving school and got my CDL. I’ve worked steadily since then and upgraded to KANE in 2016. I drive to the NYC metro area three-to-four times a week, typically 12-hour days. While there are certainly stresses associated with NYC driving, I’m able to get out and back the same day and spend time with my family. I really enjoy working with my fellow associates, especially the dispatch team. At KANE, it’s not a cold environment where you feel like a number that’s just getting sent off. I know that JP (John Puthorosky) and the team cares about me and my safety on the road. Outside of work, I coach baseball and the team in dispatch works with me so that I can continue to do it. That flexibility is terrific. You just don’t get that everywhere. I’d say that dealing with schedule changes is challenging, but that’s just part of the industry. I completely understand the demands on the business, and the team works with all of us as equal partners to satisfy our customers. Qualcomm is great for keeping in touch with the terminal. Having GPS on my smartphone is also an excellent tool. It’s amazing how far technology has come since I started twenty years ago. There is so much info available – how can you get lost? I understand the importance of the ELD mandate and HOS rules, but I have an issue with getting punished if I’m held up in construction or traffic. Especially in and around NYC, there is so much time spent waiting in traffic and I don’t feel that it should be held against the driver. You would think that with all the technology available, there would be a way to accurately monitor and deduct downtime not caused by the driver in a fair and transparent way. Hopefully, we’ll see something like that in the future. Let’s just say I’ve been flashed more than once. Crazy. I love steak and the Petro is my stop for a special treat. I think people are generally not being trained enough, which is both a safety issue and a deterrent for people considering a career in driving. Hopping into a truck after three weeks of training is not a recipe for success. At best, many drivers get overwhelmed and burnt out on being a driver and, at worst, there are accidents and drivers getting fired. It’s not a great system and it probably keeps people from looking at the profession. At KANE, we have a lengthy and thorough training process that makes sure safety remains the #1 priority. I also think that it’s dangerous to have 18-year-olds driving. I think 21 is even too young. When I started, the youngest you could be was 23. I know the industry needs drivers, but 18 is just too young. It’s a dangerous idea. Slow down and take your time. Don’t be in a hurry. Plan your day to the minute. Make sure to add in buffer time to account for traffic, construction, and unforeseen surprises. With HOS, you only have a limited amount of time on the road. Be prepared and make the most of your day.